People have been aware of the healing properties of cedar oil for a long time. 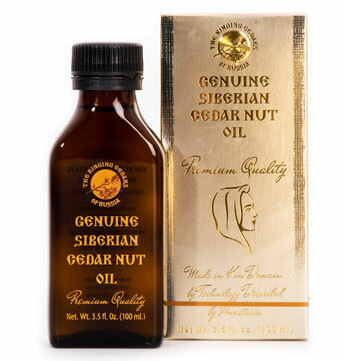 Russian cedar nuts were exported to England and other countries as early as the reign of Ivan the Terrible. The price of cedar oil on the world market has always been high. Demand for cedar oil was never satisfied. So what gives this product its healing properties? Druids, the ancient Celtic priests, possessed deep knowledge about the nature of trees and their connection with man and the Universe. Cedar oil proteins contain 19 amino acids, of which 70% are vital. Vitamins in the oil help the human body to grow (vitamin A). They stabilize the central nervous system, improve blood composition and favorably affect skin tissue (vitamins B and D). The oil is very rich in vitamin E (tocopherol - from the Greek for "bearing offspring"). Studies have shown that sables are unable to reproduce if their ration does not include cedar nuts. The oil is very rich in vitamin P: it contains three times as much vitamin P as the product called "Vitamin P" made using fish oil. Vitamin P is made up of vital fatty acids, which help to reduce the level of cholesterol in your bloodstream and prevent the formation of plaques on the walls of blood vessels. However, the main "surprise" in cedar oil is that its chemical composition is similar to human citamins! Citamins are a new class of medication containing biologically active additives, which are a balanced set of biologically active substances with organotropic effects, extracted from animal tissue, which contain physiological concentrates of mineral substances, microelements and vitamins in an easily-digestible form. Thus, the similar chemical composition of cedar oil and citamins leads us to the thought that the cedar is an equivalent of animals, including humans, in the world of plants. Cedar oil itself could be considered to be a plant citamin. Given these facts it's easy to see why the cedar has long been a symbol of health and longevity and why its healing properties are so strong.